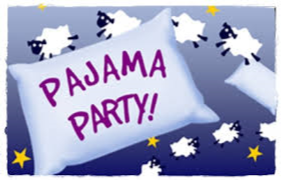 News at Spencer Public Library: It's Pajama Party Story Time with Sarah Beth! It's Pajama Party Story Time with Sarah Beth! Storytime is at 10:00 on Tuesdays. Celebrating All Those Holidays Was Hard! So on Tuesday, January 3rd , let's just stay in our jammies and have a very special Story Time with Sarah Beth!